Zero-gravity fun, astonishing space station views and more cosmic gems from September 2018. Russian cosmonaut Oleg Artemyev captured this image of the Earth at night from the International Space Station on Sept. 23. An aurora glows on the horizon. 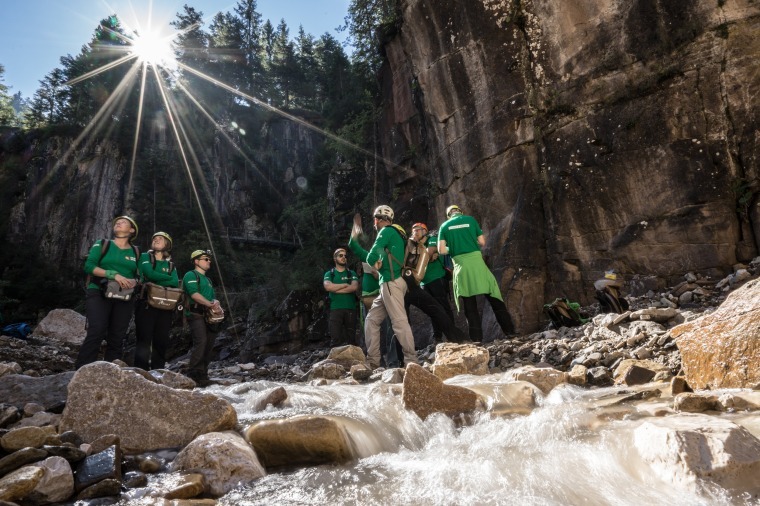 Members of the European Space Agency's Pangaea team explore their surroundings in Italy's Bletterbach Canyon in an image released on Sept. 14. The Pangaea course is designed to provide European astronauts with introductory and practical knowledge of Earth and planetary geology to prepare them to become effective partners of planetary scientists and engineers in designing the next exploration missions. 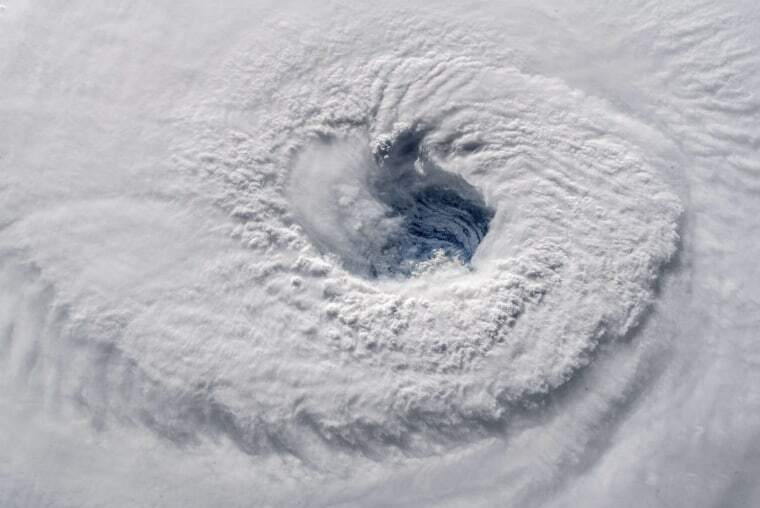 A high-definition camera outside the International Space Station captured this view of the eye of Hurricane Florence on Sept. 12 as Florence churned across the Atlantic. Long before Florence started grinding its way across the Carolinas, weather satellites were peering down from space to capture detailed images of the storm and to help meteorologists track its path and intensity. 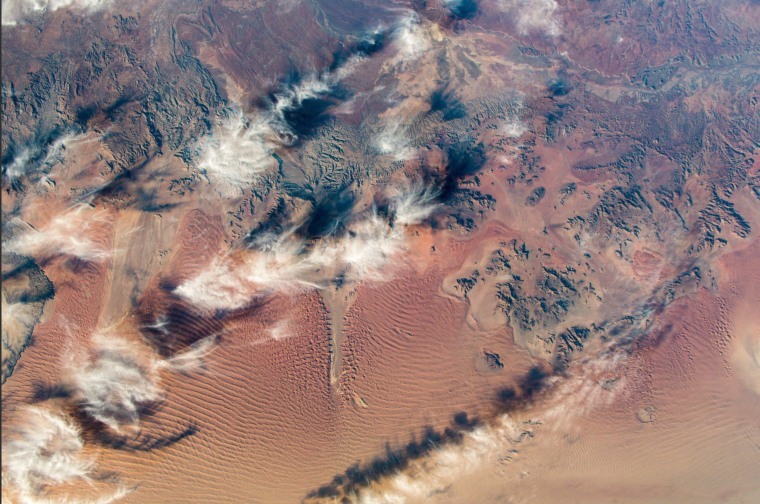 German astronaut Alexander Gerst tweeted this photo from the space station on Sept. 19, writing "This is why deserts are called the history book of our planet. This one is in southern Africa." 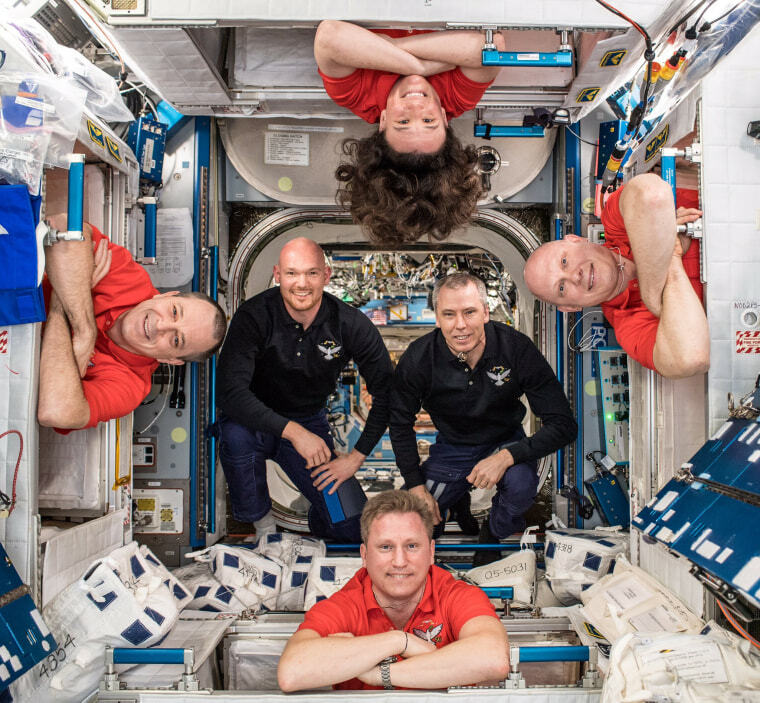 The crew of the space station poses in this photo released on Sept. 6. In the center is German astronaut Alexander Gerst, left, and NASA's Drew Feustel. On the edge, clockwise from left, NASA's Ricky Arnold and Serena Aunon Chancellor and cosmonauts Oleg Artemyev and Sergey Prokopyev. 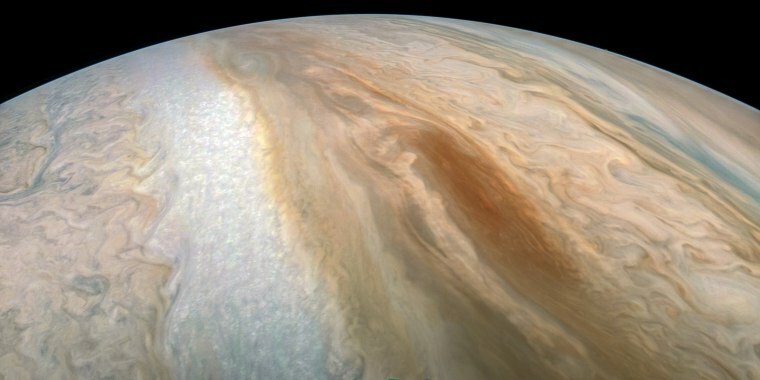 A long, brown oval known as a "brown barge" in Jupiter's South Equatorial Belt is captured in this color-enhanced image from NASA's Juno spacecraft, released on Sept. 14. Brown barges are cyclonic regions that can often be difficult to detect visually because their color blends in with the dark surroundings. At other times, as with this image, the dark belt material recedes, creating a lighter-colored background against which the brown barge is more conspicuous. Brown barges usually dissipate after the entire cloud belt undergoes an upheaval and reorganizes itself. 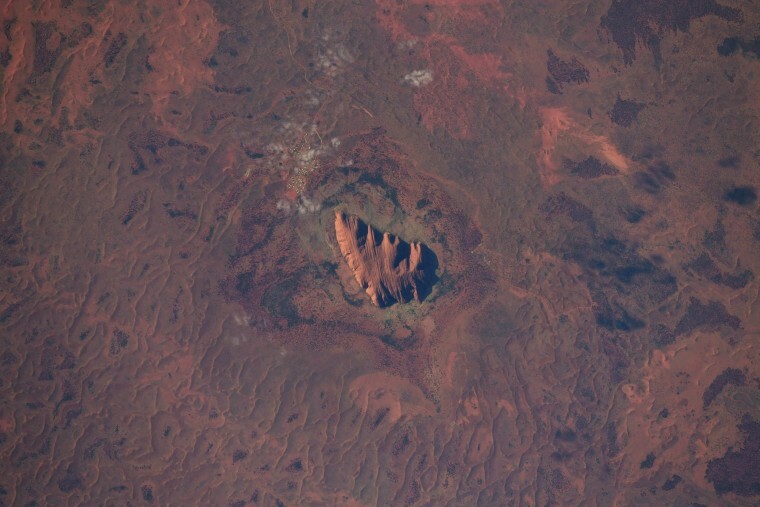 NASA astronaut Ricky Arnold captured this view of Australia's iconic Uluru, or Ayers Rock, on Sept. 19. Perhaps the most recognizable symbol of the Outback, the monolith is sacred to indigenous Australians. 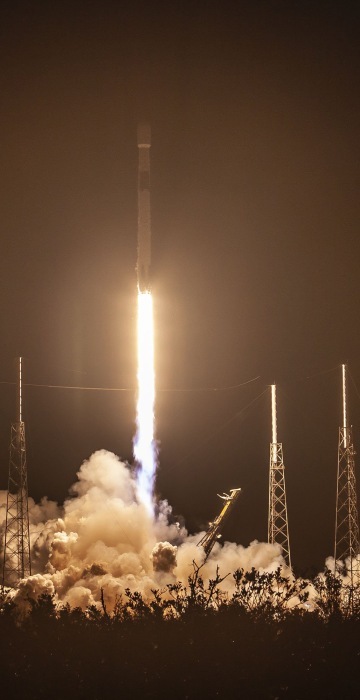 A SpaceX Falcon 9 rocket successfully lifts off early on Sept. 10 from Cape Canaveral Air Force Station in Florida, carrying the Telstar 18 VANTAGE satellite. 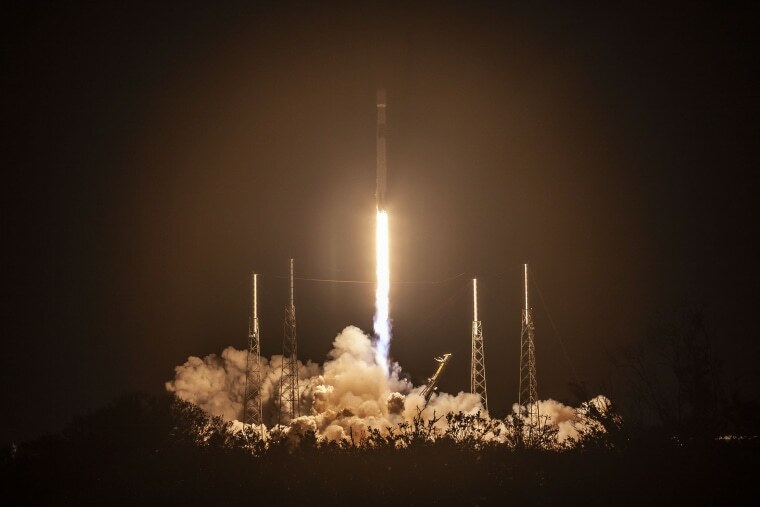 The satellite was deployed into orbit approximately 32 minutes after liftoff. 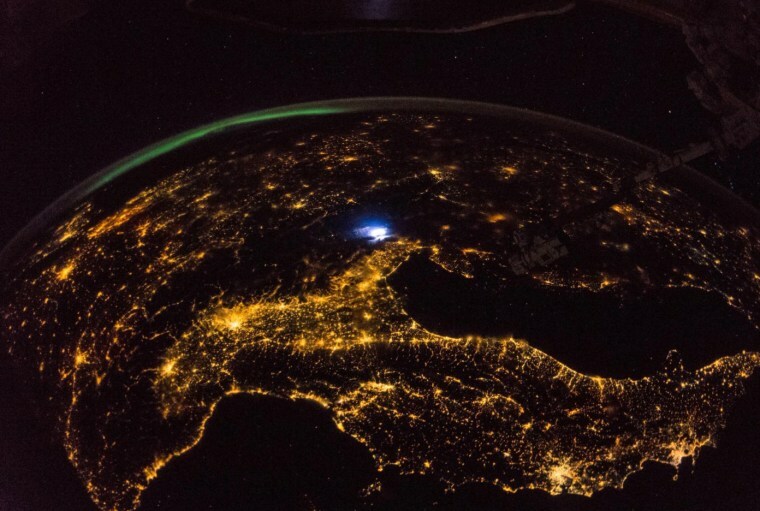 Astronaut Alexander Gerst tweeted this view from the space station on Sept. 22, writing "From space it's pretty clear that #Europe belongs together." 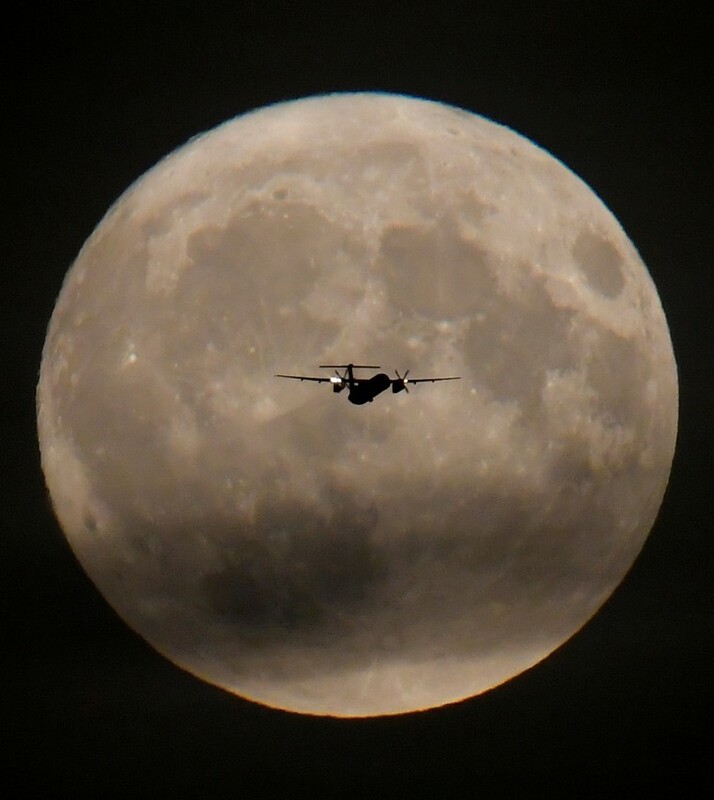 A passenger plane passes in front of the full moon as it begins its final landing approach to London's Heathrow Airport on Sept. 24. 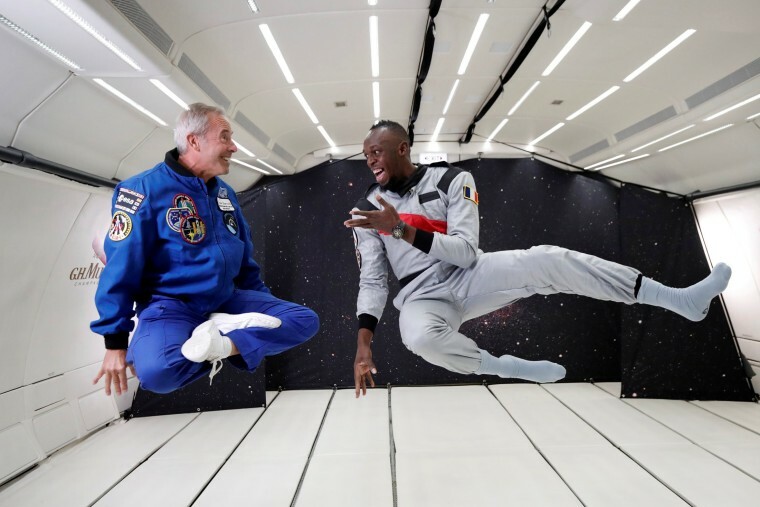 Retired sprinter Usain Bolt and French astronaut Jean-Francois Clervoy, CEO of Novespace, enjoy zero-gravity conditions during a flight in a specially-modified plane above Reims, France, on Sept. 12. The fastest man on the planet was helping to promote a champagne bottle designed for space tourists. The spiral galaxy NGC 3981 is captured in all its glory by FORS2, an instrument mounted on the European Southern Observatory's Very Large Telescope. The image was released on Sept. 10 as part of the ESO's "Cosmic Gems Programme," aimed at obtaining images with the ESO telescopes for the purposes of education and public outreach. 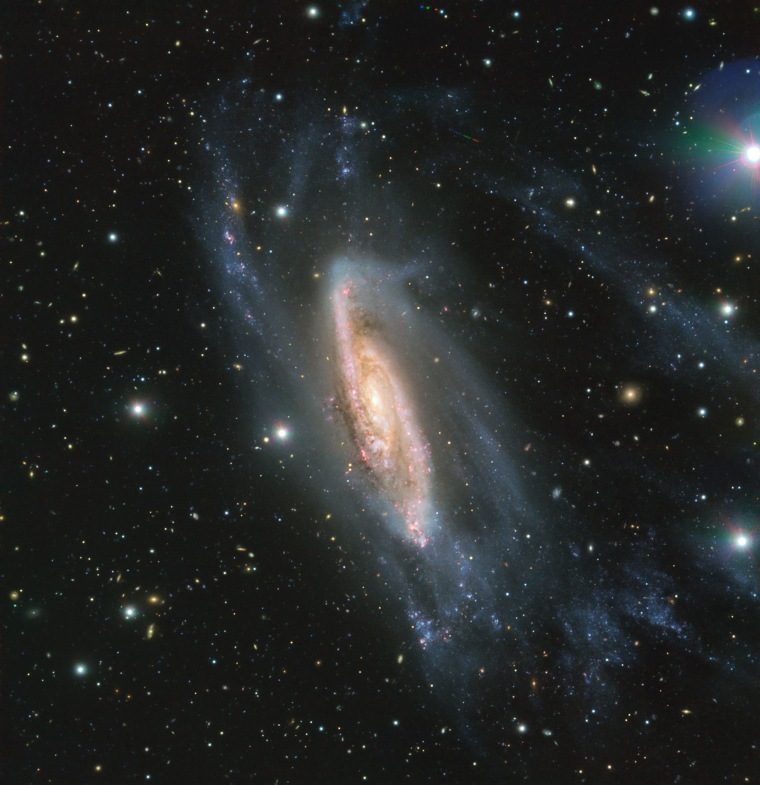 Because NGC 3981 is inclined toward Earth, astronomers are able to look right into the center of the galaxy. 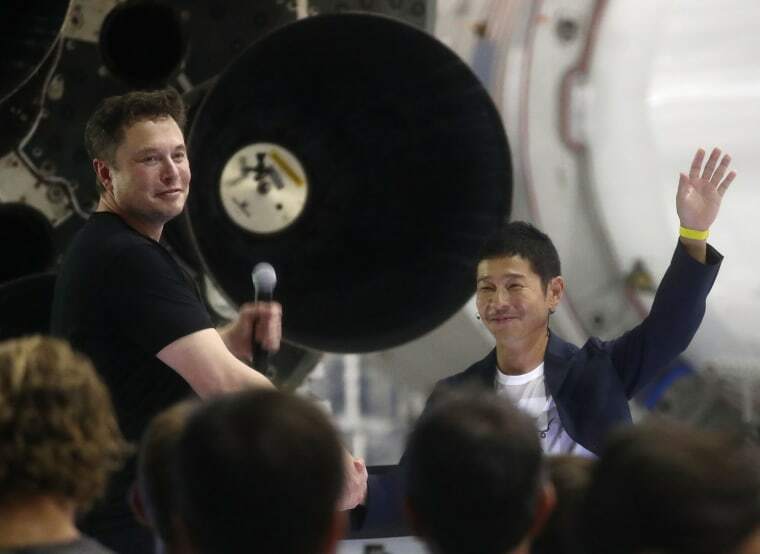 SpaceX CEO Elon Musk shakes hands with Yusaku Maezawa on Sept. 17 in Hawthorne, California. Musk said Maezawa, the billionaire founder and CEO of Japanese fashion retailer Zozo, would be the first private passenger to fly around the moon on a mission the company has planned for 2023. 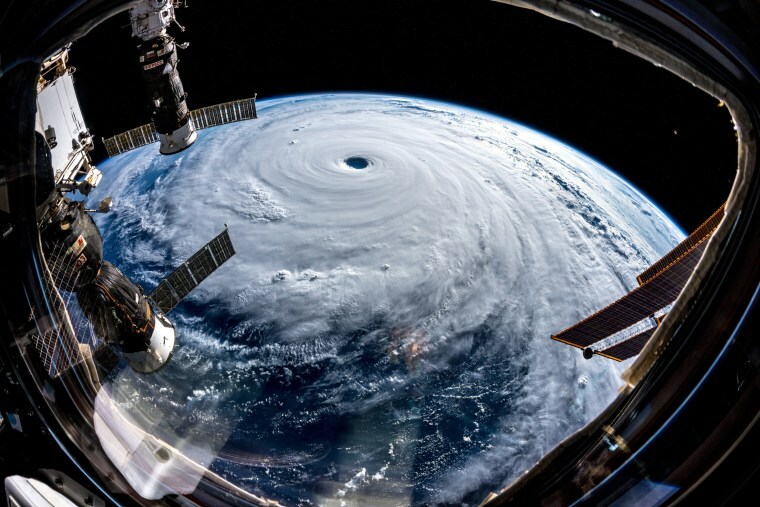 Typhoon Trami churns over the Pacific Ocean in this view from the space station on Sept. 25. 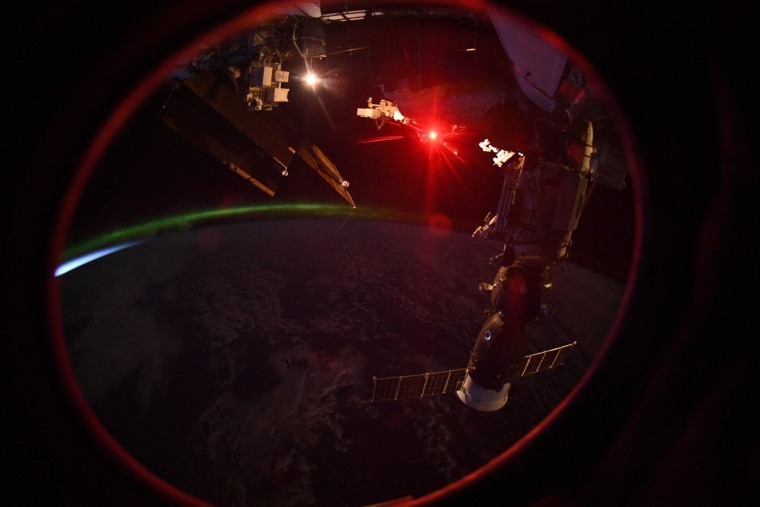 Astronaut Alexander Gerst posted the image, commenting "As if somebody pulled the planet's gigantic plug. Staring down the eye of yet another fierce storm." 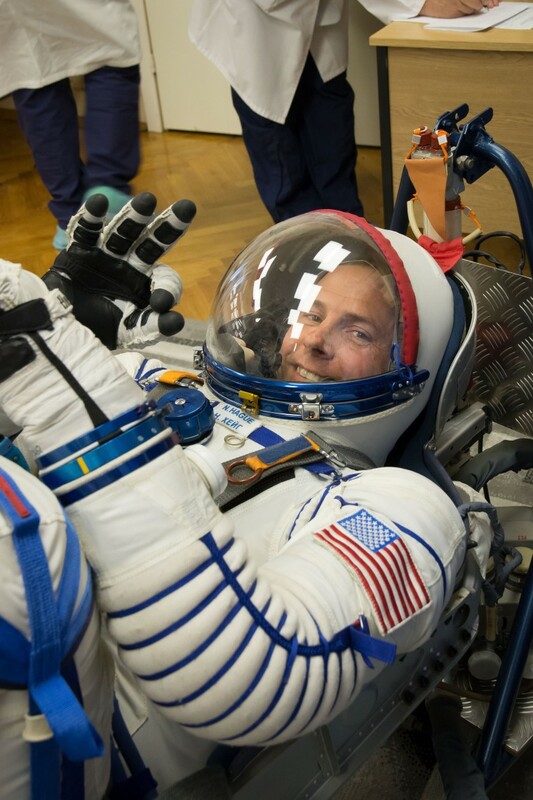 At the Baikonur Cosmodrome in Kazakhstan, Nick Hague of NASA flashes a smile in his Russian Sokol launch and entry suit on Sept. 26 during a pressure and leak check as part of pre-launch training activities. Hague and Alexey Ovchinin of Roscosmos will launch Oct. 11 in the Soyuz MS-10 spacecraft from the Baikonur Cosmodrome for a six-month mission on the space station. 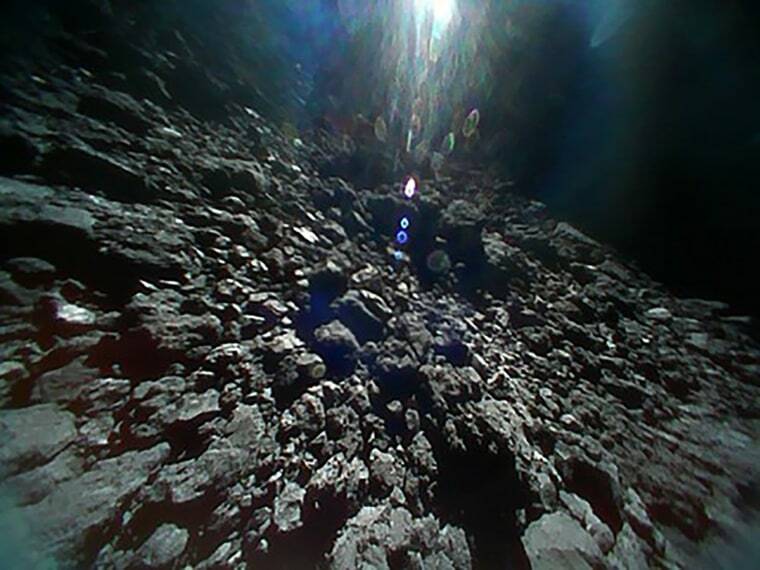 The surface of the Ryugu asteroid was captured in this image on Sept. 23 by a Japanese rover after a three-and-a-half-year journey of 2 billion miles. Launched in December 2014, Hayabusa 2 finally caught up with Ryugu in June and began nestling up to the half-mile-wide asteroid before deploying the rovers. Jasmin Moghbeli of the 2017 NASA astronaut candidates class visits NASA's Goddard Space Flight Center in Greenbelt, Maryland, on Sept. 26. 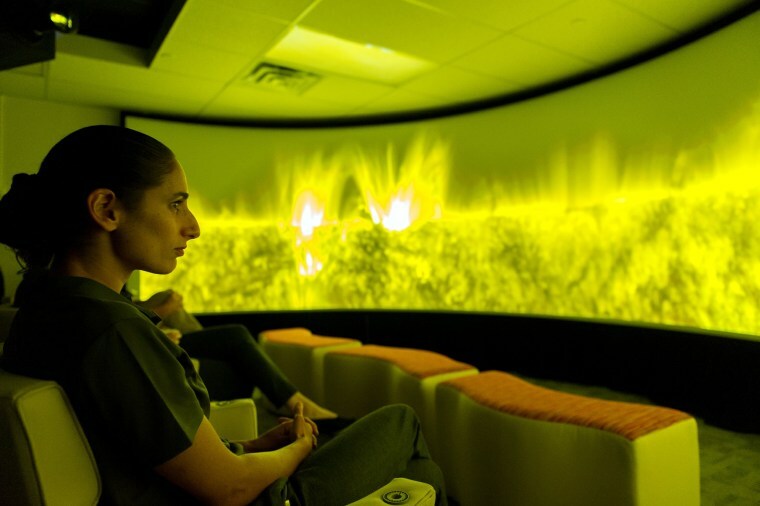 Moghbeli and other candidates for the NASA astronaut corps are currently undergoing a candidacy training program at the agency's Johnson Space Center in Houston. 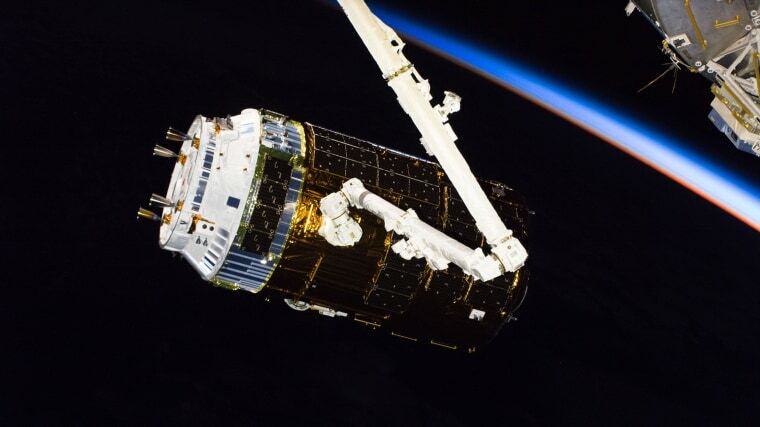 Japan's H-II Transfer Vehicle-7 is held by the space station's Canadarm2 after it was captured by the arm's operator, NASA astronaut Drew Feustel, on Sept. 27. The HTV-7 took a four-and-a-half day trip to the station after launching Sept. 22 from the Tanegashima Space Center in Japan.